American painter Grant Wood (Feb 13, 1891-Feb 12, 1942) is probably best known for his iconic 1930 painting: American Gothic. While the painting itself is at the Art Institute in Chicago, Seward Johnson’s sculpture “God Bless America” – an homage to the artwork – has been touring the country over the past few years. In October 2010 it was installed in front of the Dubuque Museum of Art, which contains one of the world’s largest collections of Grant Wood artwork. Originally planned for 7 months, the installation is still on display in Dubuque as it keeps getting extended. 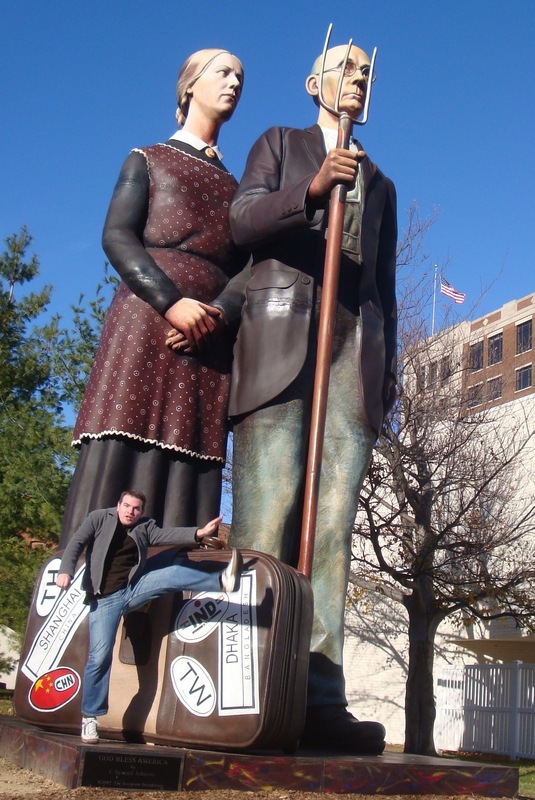 This entry was posted in High Kick Photos and tagged American Gothic, Dubuque Museum of Art, Grant Wood, High Kick, Seward Johnson "God Bless America". Bookmark the permalink.